It is difficult to take too much pleasure out of Houston’s weather for today, and the foreseeable future—and it will be sublime after our long, muggy summer—with an intensifying hurricane bearing down on the Florida Panhandle. Unfortunately, Michael strengthened overnight into a 145-mph, Category 4 hurricane overnight. Moreover, its central pressure continues to fall this morning, indicating further strengthening is possible before a landfall later today near Panama City. This is the most devastating storm that northwestern Florida has ever seen. 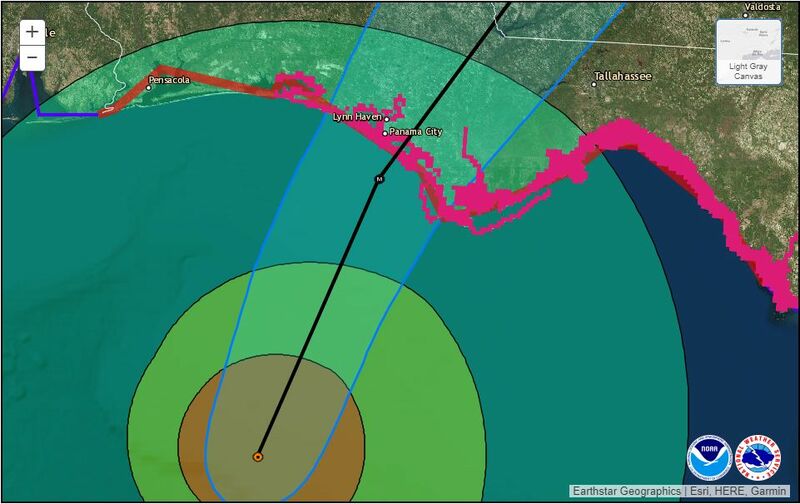 Wind damage will be extensive, with even inland areas such as Tallahassee likely seeing sustained hurricane-force winds, and storm surge to the right of Michael’s landfall will be highly significant. Please heed all warnings from the National Hurricane Center. Meanwhile, closer to home, a modest cool front is approaching the region and will push fully through Houston this morning. This should help clear out our skies and bring drier air in beginning around noon or shortly thereafter. Highs today likely will be in the mid-80s, perhaps a bit cooler for northern areas, and a bit warmer for southern areas. The dry air will really be felt tonight, as the Sun goes down and temperatures begin to fall into the 60s. This will be the really first fall-like night of the season, and the coldest night in the region since May. The coastal flooding in low-lying areas such as Bolivar, which is due to Michael and high tides, should begin to abate later today and tonight as northerly winds exert their influence. We’ll have two more splendid fall days, with high temperatures ranging from 80 to the low 80s. Thursday night will be cooler like Wednesday night (shown in the graphic below), but Friday night and Saturday morning will be a tad warmer—likely upper 60s—as some moisture begins to return from the Gulf of Mexico. A bit warmer, with highs in the low- to mid-80s, as the onshore flow resumes and humidity levels creep back up. This will still be our nicest weekend day in a long, long time however with mostly sunny skies. Some scattered showers are possible on Sunday, and especially Sunday night, as a stronger cold front approaches the area. Expect partly sunny skies, with highs in the mid- to upper-80s, and a warmer more humid day. But this heat won’t last, especially after the front pushes through late Sunday night or Monday morning. 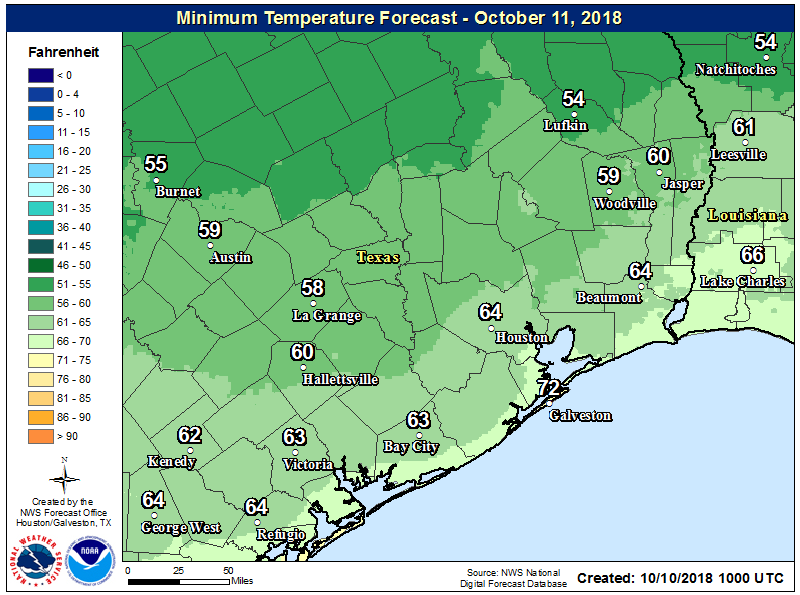 Most of next week looks downright cool for fall in Houston, with high temperatures in the 60s and 70s, and several nights with lows in the 50s. Still not sure about the sunshine and cloud mix, but we can be pretty confident in the region’s coldest week in at least six months. Hello Eric! What are your thoughts on the Disturbance #1 in the Caribbean that the National Hurricane Center now giving 50% of development over the weekend or early next week? Does arrival of the cold front mean that we are back in the normal October weather pattern that would keep any development away from us? We are scheduled to leave on Sunday for 2 weeks and I am feeling a bit uneasy when there is possibility of tropical development so close to the Gulf. Thank you for your time! Obviously, it is not a 100% guarantee, but between time of year and the approach of a strong cold front, our hurricane season is pretty much over. Prayers to all in the path of Major Hurricane Michael. Listen to Eric and obey NHC and Local WFO warnings and instructions . Thank you Eric and Co for all you do. Praying for the folks in Florida, especially the ones who chose to stay. Hopefully, they wrote their SSN# on their arm. This season has felt very bizarre to me….Leslie has been drifting and dancing over the Atlantic for a long, long time..Two monster hurricanes ( Florence And Michael) almost back on back….The tiniest storm remnants come back to life to worry us..As if the divine powers want to stay angry at us..I am praying for Florida..
Will the cooler temperatures stay for the remainder of the month? I have a vacation planned for July 31, 2023. What can I expect for weather? Will my flight be delayed. Your airline will go bankrupt because of all the delays that month. Rebook with somebody else. Please specify within +/- 2.31 minutes your expected departure time. Still waiting to hear if the northeast corner of my back yard will get rain at precisely 3:05 AM Saturday. It depends-do you live in Katy? You should evacuate, just in case. A week ago it was just blob of moisture that had 10% chance of developing and originally aimed in our direction. I believe you said you didn’t expect it to come our way, but even if it did, it would just be a weak tropical storm. Well, you got the first part of that right, and thank God you did! Had it come our way, wind shear in our area would have shredded it. Had it tried to come our way, wind shear in our area would have shredded it. There is little shear towards Florida which steered it their direction unfortunately. Eric, is this a typo? You said HIGH temperatures next week would be in the 60s. You obviously meant LOWs in the 60s. Or maybe I’m just having one of those dreams again when Houston weather is actually bearable, pinch me. Currently on break at a conference in Galveston. It certainly “feels” like something is lurking out on the Gulf. Eric, I’m curious what kind of impact Michael will have on the red tide that’s been menacing Florida’s Gulf Coast? I am in the model/forecasting biz but only a casual weather nerd. It seems to this casual observer that the NOAA models are consistently under-estimating storm/hurricane intensification. They do seem accurate on wave-to-depression conversion percentage accurately. Am I wrong in this impression, are there back-castings that the team performs in the off-season? in a storm like this. Hope those folks come through all right.